Apart from embedding external Tableau reports into Metric Insights, you can create new Metrics and Reports using data from Tableau Reports (often referred to as 'Views'). A list of reports may be 'stored' within a Tableau Data source and can be collected manually (via CSV file), automatically or even on the fly (while creating a respective report). 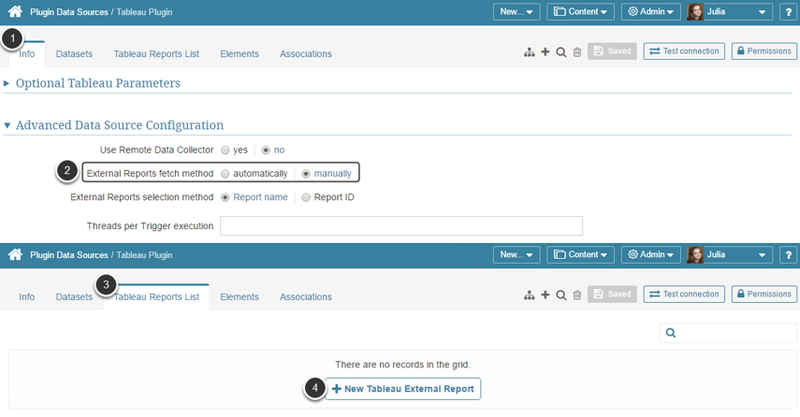 After creating a Tableau plugin and successfully connecting to your Tableau server, go to Admin > Data Sources > select the plugin you have created > open Tableau Reports List tab. You will find out that this list is empty, but in order to create new elements and for using Tableau as a data source, you need actual data. Open the Tableau plugin account you have created and go to the Info tab. Move to the Advanced Data Source Configuration section below the parameters list and set the External Reports fetch method field to 'automatically' and Save your changes. Move to Tableau Reports List tab. Result: The list of reports is going to be automatically populated. If the Tableau Report (View) is not defined in the Plugin list of Reports, you can manually add it right in the Report / Metric Editor. 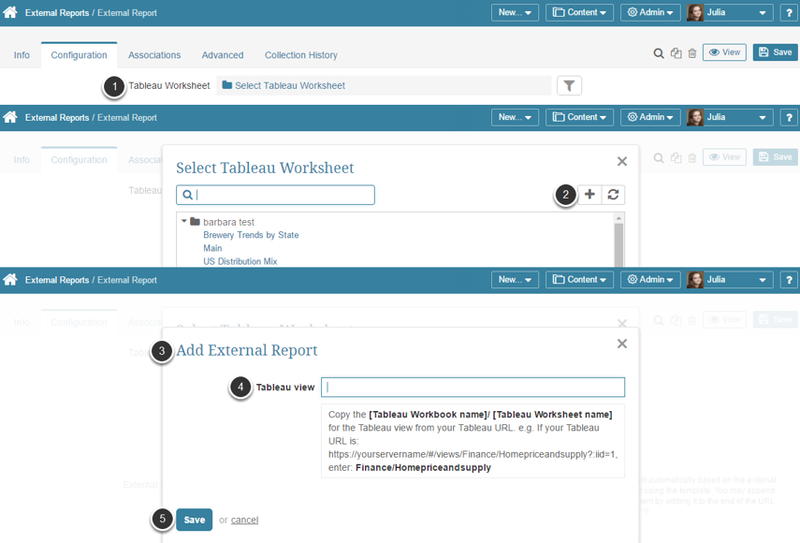 Once you reach the Tableau Worksheet field, you are not limited to the options available in the drop-down list. Click Select Tableau Worksheet. In the opened pop-up click the Plus button. The Add External Report pop-up opens. Copy the [Workbook name]/[View name] for the Tableau view from your Tableau URL.